MINEOLA, N.Y. (AP) — Thanksgiving travelers scrambled to change their plans and beat a storm expected to bring snow, slush and rain to the crowded Washington-to-Boston corridor Wednesday on one of the busiest, most stressful days of the year. Forecasters said major Northeast cities will probably see moderate to heavy rain most of the day, though New York and other places were also gearing up for several inches of snow. 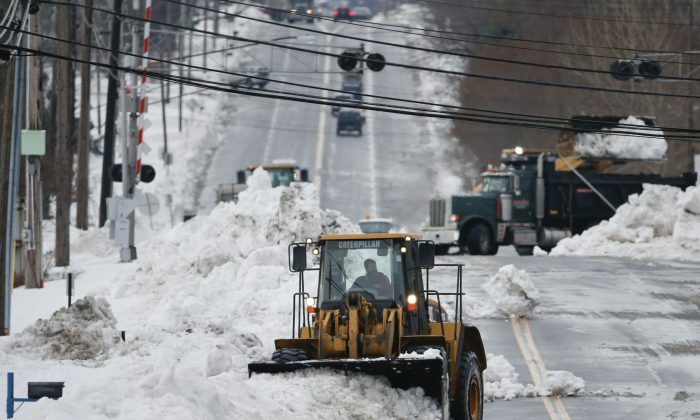 Higher elevations west of the Interstate 95 corridor could see as much as 6 to 12 inches before the nor’easter exits Wednesday night, meteorologist Andrew Orrison said. “I always go on Tuesday to try to avoid the Wednesday rush, but it seems like more people are leaving on Tuesday now,” said Bill Fraser, a landscaper from Henniker, New Hampshire, who was taking a train from Boston to New Rochelle, New York, to visit his mother for Thanksgiving. Jenna Bouffard, a New York City public relations executive headed in the opposite direction, changed her bus ticket from Wednesday to Tuesday. “I don’t want to risk it,” she said. “I’d rather be safe than sorry, and if it doesn’t snow, then I just have an extra day at home with my family” in Uxbridge, Massachusetts. Major airlines dropped their ticket-change fees for people flying in and out of the Northeast, allowing passengers to try to sneak on an earlier flight, though that appeared to be a challenging proposition, since most planes were filled. By midafternoon Tuesday, just 14 flights within the U.S. were canceled for Wednesday, according to tracking service FlightAware. That’s well below the norm for even a sunny day. United said it was planning to cancel 100 flights Wednesday in and out of Newark Liberty Airport in New Jersey — a small fraction of the traffic there. Delta planned to scrub 57 flights. The Port Authority of New York and New Jersey, which operates Kennedy, LaGuardia and Newark Liberty airports, said it was lining up extra staff and snow removal equipment in the event of a heavy snowfall. Crews were prepared to work in 12-hour shifts if necessary, officials said. At Newark Airport, retiree Sue Hansen, who lives in Roscoe, Illinois, arrived early on Tuesday to avoid the rush ahead of a big family reunion near Morristown, New Jersey. In Vermont, public safety officials warned that travel could be treacherous. Up to 16 inches of snow was forecast in some areas. There was a bright spot in the forecast for residents of western New York, which last week saw up to 7 feet of snow. “Buffalo will predominantly miss this event,” Orrison said. On Thanksgiving eve, a winter storm warning in Penn. PHILADELPHIA (AP) — Expects rain and snow before the turkey and trimmings. Forecasters say a storm bringing 4 to 12 inches of snow could hamper Thanksgiving-related travel in Pennsylvania. The National Weather Service on Tuesday placed most of the state under a winter storm warning effective from Wednesday morning through late Wednesday night or early Thursday. The weather service says precipitation will start as rain in southern Pennsylvania before changing over to snow. It’ll be all snow in the northern counties. Forecasters say portions of southeastern Pennsylvania area will see 4 to 8 inches of snow. Central Pennsylvania could get up to 8 inches and the Poconos could see a foot. The weather service says holiday-related travel should be finished by late Tuesday or early Wednesday to avoid significant delays. The state Department of Transportation advises motorists to allow build-in extra travel time.